Due to the Thanksgiving holiday here in America, I’m going to take today off and skip this week’s serial history and just let you plunge right in to chapter six of The Crimson Ghost. I will, however, give you a heads up, and let you know that next week I’ll be writing about one of the most popular characters of the French silent serials, and indeed of all French crime fiction in general, Fantomas. Actually, a large part of my plan for the day is to watch the original five-part serial based on the character which was produced in 1913 and 1914. Each chapter runs roughly an hour, and they are all available for streaming on Netflix, with the first part here. Anyway, for now let’s move on with chapter 6 of The Crimson Ghost and see how our hero escaped that fiery collision with the airplane, shall we? Next time: Chapter 7 of The Crimson Ghost: “Electrocution”, and Fantomas. Be here! It’s Thanksgiving, and of course that means lots of food, family, and television! So what better way to celebrate than a look back at some of the TV specials – and special episodes – of the past? Somebody’s got to prepare the turkey. Why not the Swedish Chef? 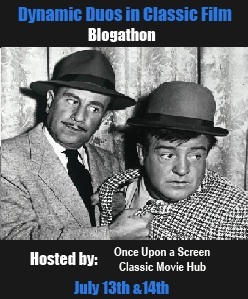 Wonder how the Clampetts celebrated “Turkey Day”? Happy Thanksgiving folks, from the entire DurnMoose family to you! I finally got around to seeing Birdman at Nashville’s Belcourt Theater yesterday, and in front of it were a couple of trailers for films that will soon be showing there (and if you’re lucky enough, theaters near you also) that really caught my eye. Filmmaker Sion Sono (LOVE EXPOSURE) describes his frenzied, gleeful new work as “an action film about the love of 35mm.” There’s a war going on. Ten years ago, yakuza mid-boss Ikegami led an assault against rival don Muto. 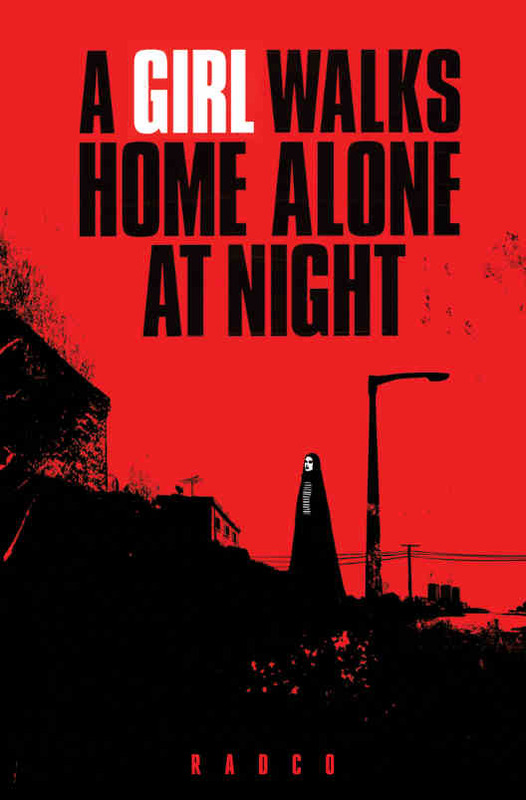 Now, on the eve of his revenge, all Muto wants to do is complete his masterpiece, a feature film with his daughter in the starring role, before his wife is released from prison. And an inexperienced but eager wannabe film crew are standing by with the chance of a lifetime: to film a real, live yakuza battle to the death…on 35mm! Endlessly irreverent and wildly, hilariously visceral, this Tarantino-esque ode to the yakuza films of yore features an over-the-top, blood-soaked finale for the ages. Strange things are afoot in Bad City. The Iranian ghost town, home to prostitutes, junkies, pimps and other sordid souls, is a bastion of depravity and hopelessness where a lonely vampire stalks its most unsavory inhabitants. But when boy meets girl, an unusual love story begins to blossom…blood red. 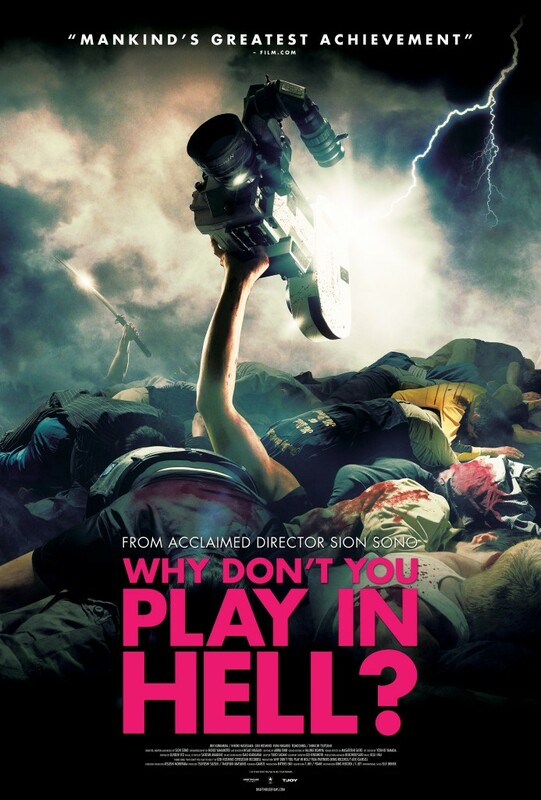 The film has been described as the first-ever Iranian Vampire Western. Yeah, I think I’m gonna be going to see that. So what do you think? Do either of these trailers intrigue you? Continuing to wend my way through the Sight and Sound Top 250 Greatest Movies of All Time. This week, it’s #072 on the list, David Lynch‘s Blue Velvet. 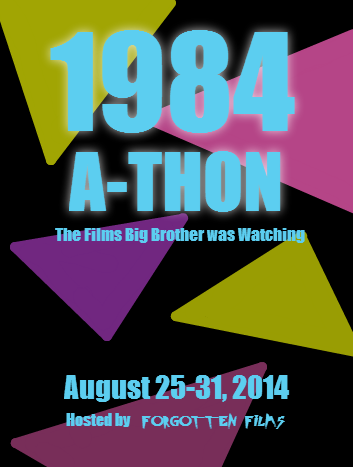 For a longer introduction to this series and a look at the full list, just click here. 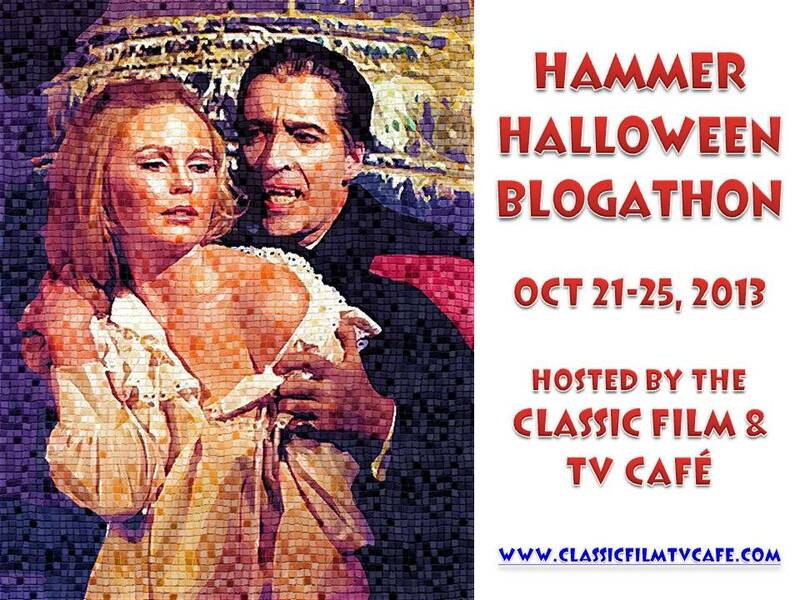 And if you want a heads-up on what I’ll be watching for next week in case you want to watch along, just head on over to the Facebook page or follow me on Twitter (both of those links are also in the sidebar) where I’ll generally be posting that info later in the day. My initial reaction to watching David Lynch’s Blue Velvet for the first time was surprise at how mainstream it seemed – at least, mainstream for a David Lynch movie. Of course, the addition of that phrase “for a David Lynch movie” changes the tenor of any discussion right at the start. Especially coming pretty directly off of a first-time viewing of Eraserhead (which you can read my reaction to here), in which it seemed as though Lynch was trying to throw every bit of outre and shocking imagery he could in any way tie into the narrative, Blue Velvet seems, despite some truly shocking moments, almost restrained. First of all, there’s the plot, which may by itself seem a departure from Lynch’s previous (and some of his later) movie(s). Not the nature of the plot, but the fact that one even exists and that he actually carries it through to the end of the film. 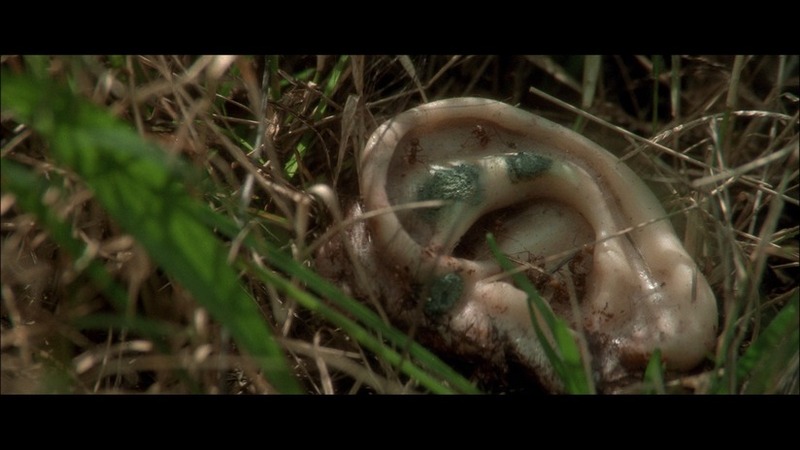 As opposed to Eraserhead, where Lynch eschewed plot for tone, or Mulholland Drive, where it seems as though he may have started with a plot, but abandoned it somewhere along the way to replace it with multiple “what is real and what isn’t?” twists and images, Blue Velvet has a true beginning middle and end, and while some of the scenes along the way may be very disturbing, they all lead to that end instead of being digressions without purpose or inserted with only the purpose of shock. Lynch also seems to have a much better control of his characters here than in many of his other films, and though by their very nature it is easy to see them as cruel and crude, disturbed and disturbing – even our supposed heroine in distress, Dorothy Vallens shows a side that makes one wonder just how much distress she is truly in and how much of that she has invited upon herself – it is that very nature that drives the film towards its conclusion. These are not characters that are simply there to be strange – though strange they may be – but to help Lynch tell the story he wants to tell. The performances, from stars Dennis Hopper, Isabella Rosellini, and a very young Kyle MacLachlan, down to smaller roles by performers such as Dean Stockwell, Laura Dern, and Jack Nance (almost unrecognizable from his turn as Henry Spenser in Eraserhead), also seem to be well under Lynch’s control, and never quite go so far over the top that they completely collapse the structure of the film, as might be the case with a lesser film maker. 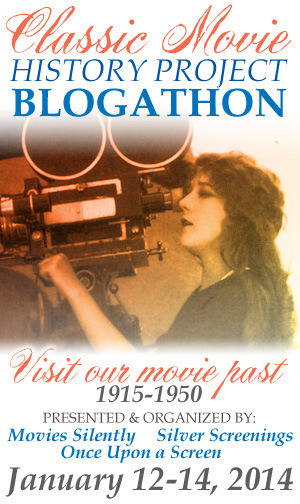 Though I also hasten to add that I can’t see a lesser film maker even attempting a movie like this in the first place. As I noted above, Blue Velvet may be mainstream for Lynch, but that still puts it pretty far outside of the real mainstream. In the end, I’m simply going to say this: if you’re a fan of Lynch, then you’re probably going to like this movie. If you’ve seen some of Lynch’s more outrageous work but not this film, then you might want to check this one out. I’m not going to promise that it will change your mind about him, but there’s a chance that it might. 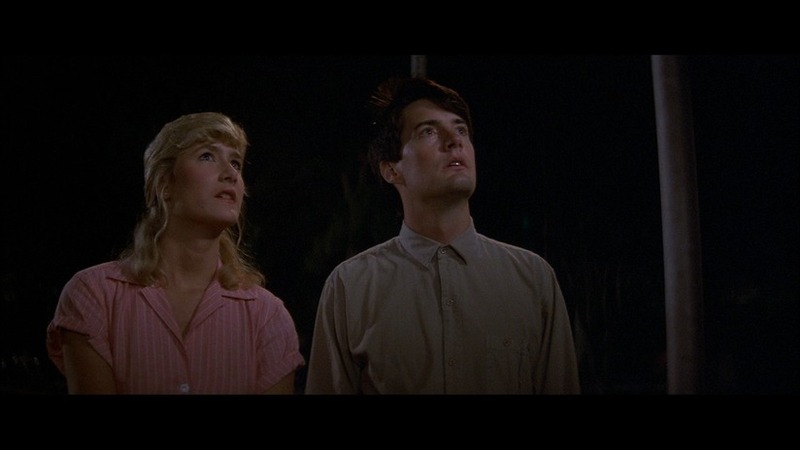 If, on the other hand, you haven’t seen any movies by Lynch because you’ve been put off by what you have heard about him and by his reputation for outrageousness, then Blue Velvet really might not be a bad place to start if you want to see just what he is all about. I’ve written and talked quite a bit lately about misleading trailers. You know the kind I mean: trailers that are cut in a way that studios think they’ll put audience butts in seats, but in the process misrepresent the tone or even the real subject matter of the movie that the people attached to those butts are actually going to see. Usually I consider this a bad thing because it often winds up with dissatisfied audiences leaving the theater saying things like “well that wasn’t at all what I thought it was going to be” and that becomes the over-riding take-away from the movie instead of thoughts on the movie they actually saw. Plus, it means a lot of times that the people who would actually enjoy the movie as it is are not seeing it because they didn’t know what was really on offer. None of which matters to the studio most times though, because what they’re really concerned about is that opening weekend box office and being able to plaster “our movie’s #1” all over tv screens the next week, even though they know that there’ll be a new number one the next weekend and it’ll be whatever’s opening big. It is, of course, a trend that’s going to continue, no matter how much I complain about it, nor how much it actually results in audience dissatisfaction. All of which is, as you might guess, leading to a huge “on the other hand…”. 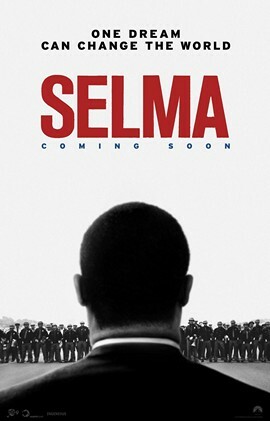 On the other hand, there are times when I actually hope that the trailer is misleading, and that the movie is going to be different than what the trailer depicts, and that’s the place where I find myself with this trailer for the upcoming movie Selma. Why? Because if the trailer really is representative of the movie, it’s going to lead me to express a sentiment that I suspect is going to prove somewhat unpopular and that I can only hope will be taken in the spirit it is being offered. Okay, that seems straightforward enough, right? 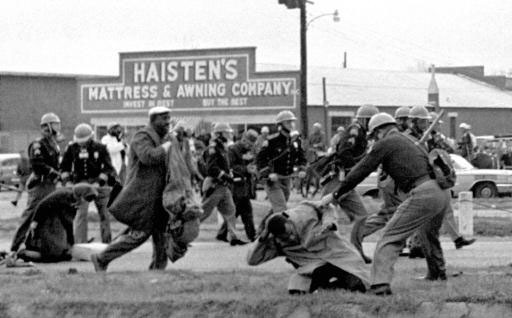 The film is about the civil rights movement and the stand which was taken in Selma, Alabama in 1965, which was led by Martin Luther King, Jr. All of which is fine, right? Well, yeah, it is. Except for one thing. And I’ll admit up front that this is going to be in a way an unfair criticism because it addresses what I wish the movie were going to be about as opposed to what the film makers want it to be about, an approach that I usually try to avoid, but which seems pertinent in this situation. Plus, it’s going to seem like I’m criticising a movie before I’ve actually seen it, something that is generally inherently unfair, but really, what I’m commenting on is more general than just this movie, it just happens to be the touchstone or flashpoint for what I’m about to say. Simply put, I wish this movie was focused on something or someone other than Dr. King. Now, according to Wikipedia, “The film is based on the 1965 Selma to Montgomery voting rights marches led by James Bevel, Hosea Williams, and Martin Luther King, Jr. of SCLC and John Lewis of SNCC.” And of those four names, there’s only going to be one that most people recognize, and that’s Dr. King. But that’s exactly the point: by focusing its attention solely on Dr. King (or actually on the conflict between King and President Johnson), Selma once again, as is so often the case, makes it seem as though the civil rights movement was mostly a one-man show, and those other names, the other leaders of the marches and those in other places as well, become simply footnotes or “and also…” types rather than garnering the respect that they, too deserve. Even more, by putting its focus almost solely on Dr. King, this movie takes away not only from the necessary support and prominence of these other leaders, but from the incredible importance of the common people, those people who put their very lives on the line alongside those leaders to stand up for their rights and for the rights of others. 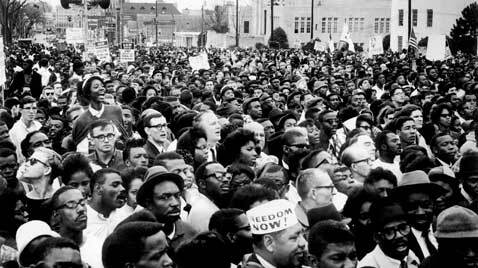 The civil rights movement was not just one man, it was thousands of people taking a stand, thousands of people saying “this is not right”, thousands of people marching in the streets, facing down authority figures and demanding that they be acknowledged and be given the same rights and freedoms as those afforded their fellow Americans. These marches were not made by one man. 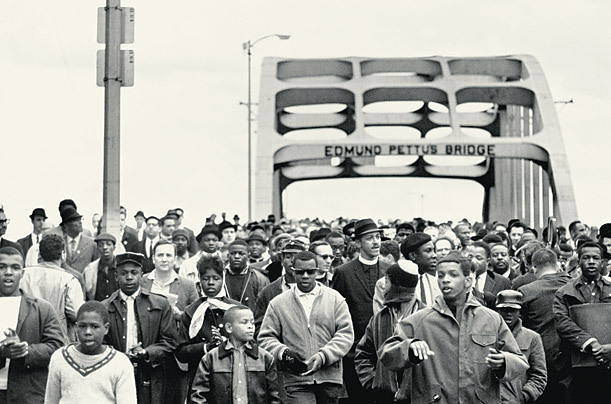 As many as 50,000 people took part in them, standing alongside their fellow man and demanding an end to the outrage of segregation. Yet even when the trailer does acknowledge the presence of those other people – “It looks like an army down there” – the focus almost immediately goes right back to and features almost solely, an image of Dr. King. For that matter, take a look at the poster above and its tagline of “One dream can change the world” with the back of Dr. King’s head the only thing of prominence, while all of the other people who had a role in making that dream come true are relegated to the far distance and become merely a mob. It really makes it seem as though the push for equality, the push for acceptance for all people to be seen as created equal, the push for justice, was only the dream of one man, as opposed to the dream of hundreds of thousands who lived under the oppressive system which was accepted as the norm at the time. As though their dreams really mean very little in comparison to his. There are actually two reasons that this disturbs and disappoints me. First, as noted above, it takes away from the inherent importance of all of those other people who also took a stand for the cause. 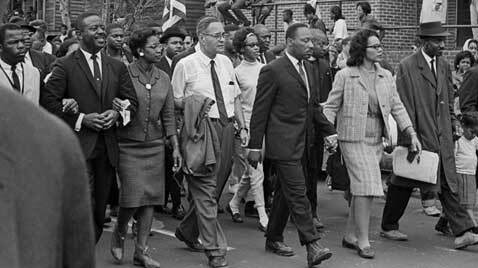 Secondly, and perhaps just as importantly, it makes it seem as though without Dr. King as a rallying point, the movement could not have taken place. Why is this a problem? Because it also makes it harder for any kind of true grass-roots movement today, any kind of fight by other groups today to realize the potential of people coming together and speaking with one voice, the vox populi, the power inherent in those thousands willing to take a stand to fight for whatever they believe in, to feel that they can move things forward, to feel that they can make strides simply by coming together and demanding that they be given attention, that they be heard. It takes away from the idea that the real power of a revolution or even a smaller and simpler drive for reform does not need to be centered around one man and his dream, but around the power and dreams of many people, the power and dreams of people who see the need for a change and are all willing, again, to put their well-being and even their lives on the line for their convictions. 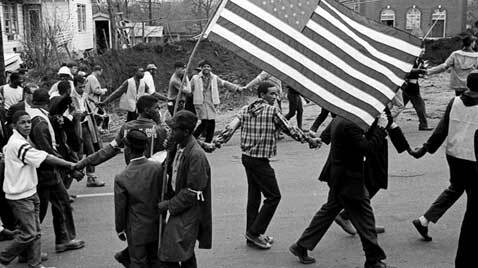 Simply put, it takes away from the recognition that the civil rights movement was exactly that: a movement of many people, and that progress on so many fronts can only be made by the same kind of movement. A movement is not one man, and while I certainly acknowledge that a movement needs leaders to give it focus and direction, to keep it on track and make sure that all those voices are pointed in a way in which they will be heard, that’s just it. A movement needs not necessarily one leader, but many. it needs leaders. Plural. But again, by focusing seemingly solely on Dr, King and making those other names – James Bevel, Hosea Williams, John Lewis and so, so many others -supporting players and turning their voices into merely background noise, it does a disservice to all of those others who took a stand, who were beaten, who died. They all had dreams. They all had voices. They all fought the fight. But they all remain largely unknown. And that is a true shame. 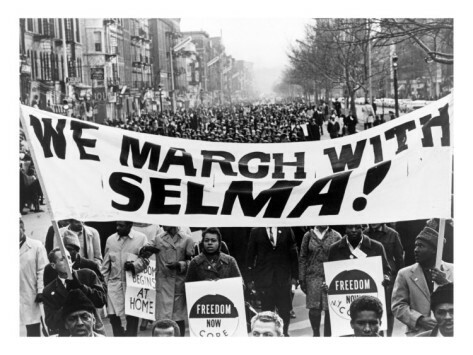 And it’s why I hope, as I said at the start, that Selma, the movie has more to offer than what we see in the trailer. So far we’ve been looking at the very early history of serials in America, but of course we weren’t the only country to realize the potential of continual stories presented as a way to draw patrons back to the theater each week. 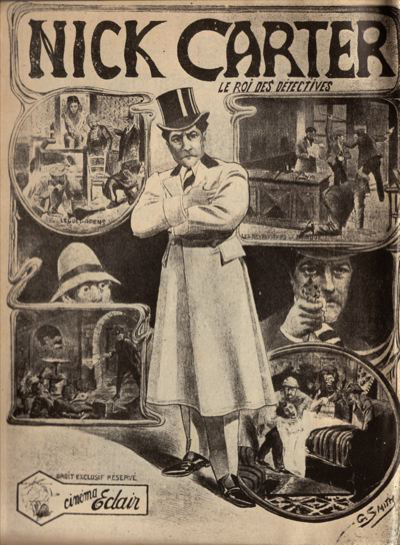 One of the other early adopters of the form was, unsurprisingly, the French, who were producing their own movie serials at least as far back as 1908, which was the year that Nick Carter, le roi des détectives (Nick Carter, The King of Detectives) was released. As his name implies, Nick Carter is actually an American invention, a master detective who first appeared in 1886 in a 13 part serial story in the magazine New York Weekly entitled “The Old Detective’s Pupil; or, The Mysterious Crime of Madison Square”. The story was written by Ormond G. Smith, the son of one of the founders of the publishing company Street & Smith. 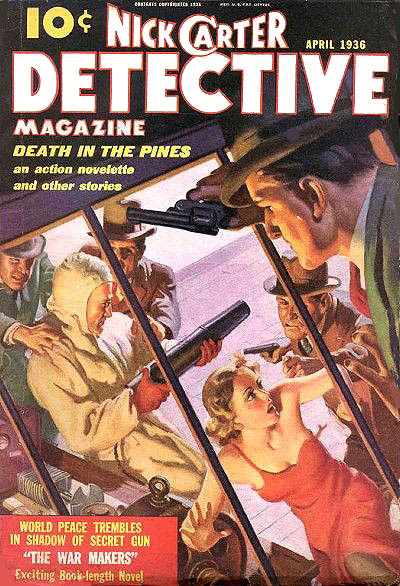 Carter proved to be a popular enough character to get his own magazine (Nick Carter Weekly, which eventually became Detective Story Magazine), and later was revived as a pulp hero during the height of that genre’s popularity. He also got his own radio show during the Golden Age of Radio. In 1908, the Nick Carter stories were also being published in France, so the E’clair studio chose him to feature in a six-part serial. Victorin-Hippolyte Jasset was tapped to direct, and Pierre Bressol starred as Carter. Like The Hazards of Helen, which I wrote about last time, whether you consider this to be an actual serial or just a series of short films could be a matter of preference, since each film stood on it’s own, though they were released every two weeks over a limited period of time, so for our purposes we’ll let the designation stand. The six episodes and their release dates were: Part 1: Le Guet-Apens (The Doctor’s Rescue) 8 September 1908; Part 2: L’Affaire des bijoux (The Jewel Affair). 22 September 1908; Part 3: Les Faux Monnayeurs (False Coiners), 6 October 1908; Part 4: Les Dévaliseurs de banque (The Bank Burglar), 20 October 1908; Part 5: Les Empreintes (The Imprints). 27 October 1908; and Part 6: Les Bandits en noir (The Bandits in Evening Dress), 15 November 1908. The serial proved popular enough to garner two follow-ups: Nouveaux aventures de Nick Carter in 1909, and Zigomar contre Nick Carter in 1912. 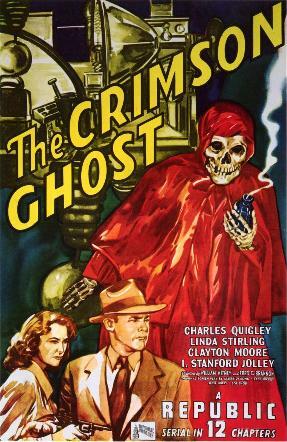 I wonder how well Carter would have done escaping the poison gas that The Crimson Ghost had used to trap our hero last week? My guess is that he’d have done pretty well, but maybe we’d better get on with Chapter 5 so we can see how he might have done it, hadn’t we? 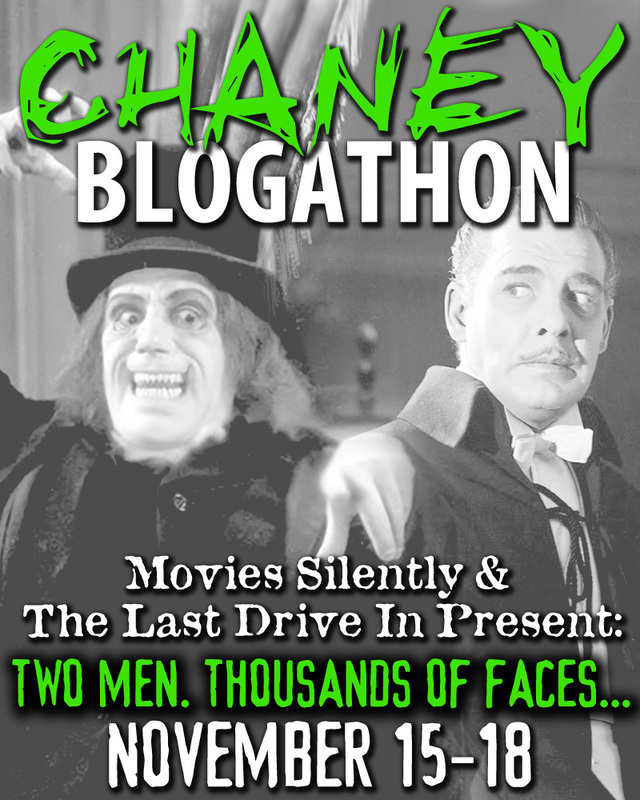 Next time: Chapter 6 of The Crimson Ghost: “Mystery of the Mountain”, and more movie serial history. Be here!